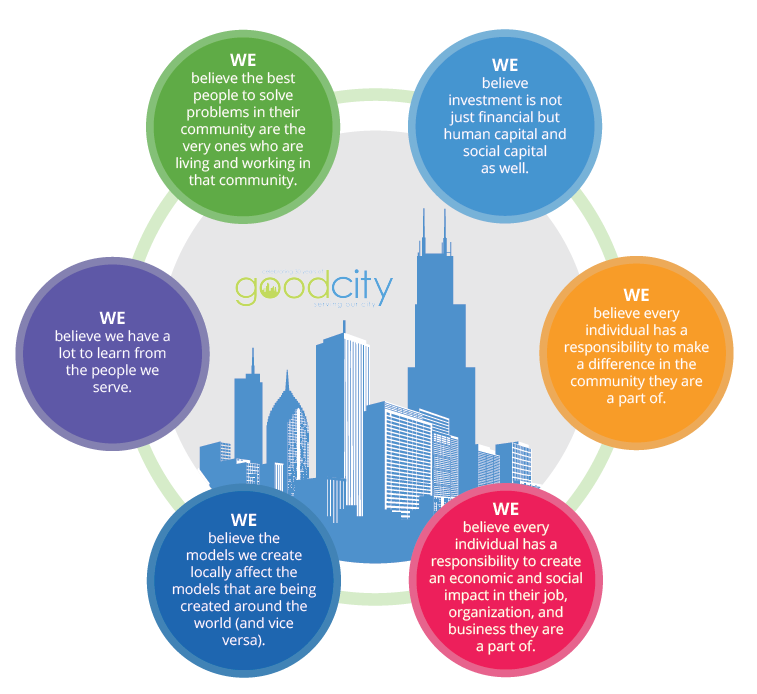 Goodcity is a human investment organization committed to identifying and supporting high potential change agents as they launch and scale impactful and sustainable for- and non- profit enterprises making a social and economic impact in the local community they are a part of. We work to solve the community's toughest problems together. "Every individual has a responsibility to invest their time, talents, and finances into the community they are a part of." "Every individual has the potential to create something good and meaningful in the work they do." 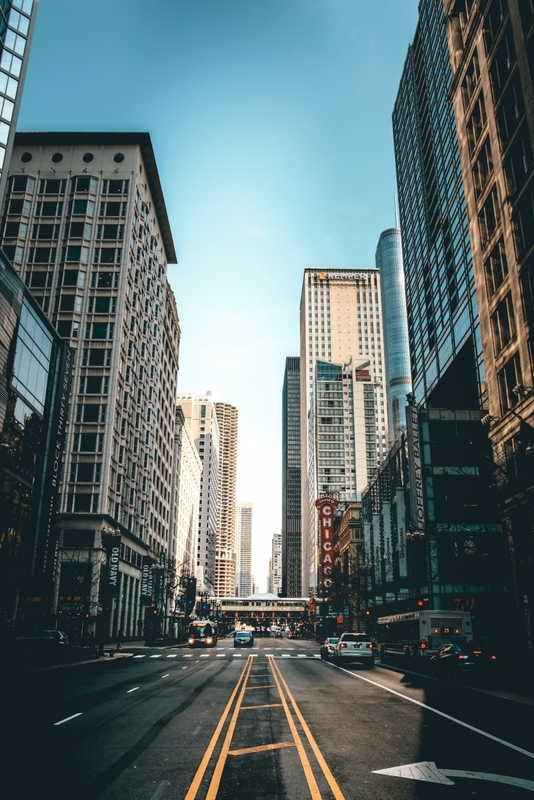 For over 30 years, Goodcity has been committed to identifying, supporting, and growing entrepreneurs who are making a difference in under-resourced and overlooked communities in the Chicago area. Central to our thinking is the belief that the best leaders for transforming our city are innovative thinkers and entrepreneurs in our local community. These are the people who live, breathe, work, and play in the many neighborhoods that make up Chicago. They know the issues because they engage with them on a daily basis through their own lives and the lives of their neighbors. These are leaders whose ideas too often are left untapped, undiscovered, and overlooked. This is where Goodcity steps in. We empower local leaders to solve local and global problems by helping them incubate their ideas, grow their organizations, and connect with other leaders with the same passions. It is a rigorous and time-tested process but, when these ideas come alive and these entrepreneurs succeed, the impact is felt throughout Chicago. 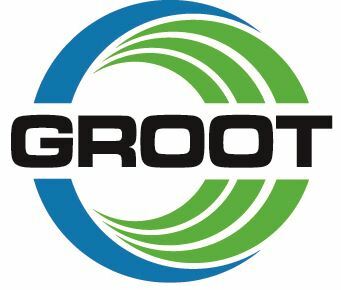 Click here for some of the key organizations we've helped launch, grow, and scale since our inception. and...surround them with our Management, Investment, and Community Services. Management (Advisory and Back Office), Investment (Charitable Grants and Impact Investments, Social Capital Investments, and Human Capital Investments), Community (Learning Cohorts, Networking, and Accountability). Organizations and lasting impact are driven by the people, the agents of change. We hold the entrepreneurs we serve at the center of our work and invest in those who share the qualities of hope, motivation, and teachability. Goodcity believes that we all have an obligation to give back to the communities in which we live and work. We continually focus on the impact we create and expect the entrepreneurs we serve to have this orientation as well. Goodcity knows that real change must be a long-term solution that solves a social issue. We work tirelessly alongside our entrepreneurs to create sustainable business models that allow for continued - not temporary - impact on the communities which we are all a part. Goodcity is dedicated to women and minority entrepreneurs across the city. 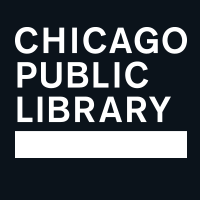 Over the past 30 years, we've identified 3 key barriers for women and minorities in Chicago; access to capital, access to management knowledge, and access to networks. Because of this, we focus all of our programs to meeting these three needs for women and minorities across the city of Chicago. Fiscal Sponsorship is a cost effective way for entrepreneurs to implement new programs, start new organizations, and test new approaches for social change in a community under Goodcity's charitable organization status. Our Fiscal Sponsorship program also provides accounting and bookkeeping services for its clients that will allow them more bandwidth to grow their ideas. Goodcity recognizes that one of the biggest obstacles for non-profits today is the need for back office services. It can be quite expensive to hire a full-time accountant to manage the books, which is why Goodcity offers its clients top-notch back office services that allow entrepreneurs to focus on growing their organization while we take care of the day-to-day office work. Goodcity provides its network with exceptional program and training opportunities because you don't always know what you don't know. Through our 30 years of experienced, we have identified key organizational trends and training necessary for entrepreneurial success. We work with you at every step of your journey to make sure you succeed. One of Goodcity's greatest strengths is our network. We have worked hard to develop and grow our relationships within the city so we can connect you with key experts across all industries. Our events are an opportunity for entrepreneur and potential partners to engage and grow together. Starting a non-profit is a daunting task. It's not easy to know where to begin. Goodcity has been instrumental in providing Sidelined Chicago with training and guidance for a successful launch this past year. 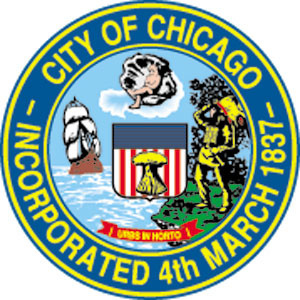 Goodcity provided Sidelined Chicago with entrepreneurial training, coaching, and accounting services that enabled our organization to build our program quickly and create a solid business plan. Eager to get involved? Whether you're interested in our programs, volunteering, or donating - we've got something for you! The Goodcity network is thriving and we'd love for you to join too! Fill out the survey below about what programs you are interested in and we'll follow-up with next steps. We'll also add you to our newsletter to keep you updated on upcoming events! Excited to join us in our mission of supporting women and minority entrepreneurs? Fill out the survey below to get involved. We couldn't do this without you! It is individuals like you who really make this mission possible. Will you join us in our mission by supporting us financially? We are grateful for your support!